Wanted – Human face of climate change! Now that scientists have spoken, loud and clear, things are beginning to happen on climate change — and not a moment too soon. Venture capitalists, policy wonks, technology geeks, security analysts and social activists are all joining the conversation — thanks largely to the media’s increased coverage of the issue. – The latest report from the Inter-governmental Panel on Climate Change, released on April 6, said greenhouse gas emissions are at least partly responsible for the warmer climate, which will pose a host of environmental and health challenges, ranging from more diseases to floods and droughts. – In March 2007, an international panel of scientists presented the United Nations with a sweeping, detailed plan to combat climate change, warning that failure would produce a turbulent 21st century of weather extremes, spreading drought and disease, expanding oceans and displacing coastal populations. And for the first time ever, the U.N. Security Council will discuss potential threats to international security from climate change. These conversations will be richer and more meaningful if the ordinary people — who are most at direct risk from climate change’s multiple impacts — were heard in the corridors of power, money and deal-making. We in the media must see beyond the important scientific projections, policy debates and UN talks — we must look for the human faces, voices and dimensions of climate change. A healthy mix of rational thinking and emotional appeal will stand a better chance of moving people to kick their addition to oil. Allowing real people to tell their own personal experiences can also be very effective. I realised this five years ago, when we commissioned the first-ever documentary on climate change and the South Pacific, made by a native Pacific islander. Voices from the Waves, directed and produced by Bernadette Masianini of Fiji, was narrated by two teenagers growing up on two islands, each facing an uncertain future. 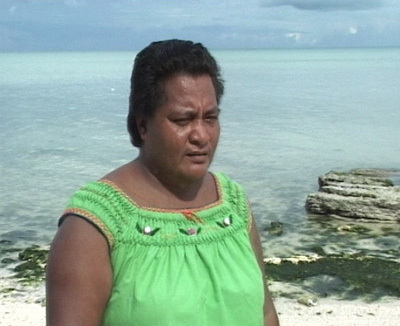 At one point we meet Mrs Saipolua, an ordinary woman who lives on the island of Kiribati, where no place is higher than a few feet above the sea. She is distressed having had to move her home twice in a past decade due to the receding shoreline. For Kiribati’s 82,000 inhabitants, climate change is not theory; it’s already lashing on their beaches. I’ve covered climate change for years as a science writer. But it was Mrs Saipolua who made me realise the impact climate change is having on millions of ordinary people who have never heard that term. Video and DVD copies of Voices from the Waves can be ordered from TVE Asia Pacific’s online e-shop. « The BBC as a Fossil Fool?